Written on 09 July 2015 . 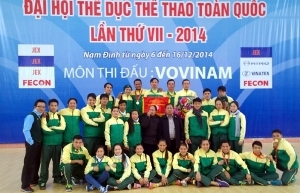 Vovinam VII congress closes with most position was given to Ho Chi Minh City (9 gold medals, 1 silver medal, 1 bronze medal); Doan Tho ranked 2nd place with 5 gold medals, 1 silver medal; The 3rd Army with 4 gold medals, 3 silver medals and 4 bronze medals. Ho Chi Minh City Union won the whole group the most. This was the fourth time Vovinam was held in the framework of a competitive sports at the Sports Congress nationally (since 2002). Over 10 years of development, in this fourth, Vovinam has attracted more than 300 athletes of 33 delegations. It was indeed a very impressive figure than the number attended by a number of other competitive sports at the congress. Vovinam is a traditional martial art of Vietnam has been on the rise very rapidly both in domestic and overseas. Attending the tournament, with the spirit of martial Vietnamese, Vovinam is not just a place to exchange, learn from experience exchange but also a place to promote Vovinam extensively to numerous friends both domestic and international. This is what Mr. Ngo Ba Huy, Vovinam Department, General Department of Sports to share with reporters believe the Sports page. Mr. Ngo Ba Huy said: The days of playing in Nam Dinh is the festival of Vovinam. Nam Dinh has done very good work of organizations and all conditions are favorable for Vovinam closed the congress a success. “In the next period, to develop, promote Vovinam widely expected in March 2015, Vietnam Vovinam team will focus on three major tournament in Southeast Asia, Asia and the World” Ngo Ba Huy share. Hopefully, the development of the Vietnamese martial essence of this land will become a widespread development and world-wide.